solutions for every room in the house. An organized laundry room will keep everything in its place and at hand and help you feel good about the task at hand. Komandor can help you organize laundry by adding upper cabinets to keep your laundry supplies out of sight. Add lower cabinets with hampers or hamper sized drawers to separate your dirty clothes before they are washed. 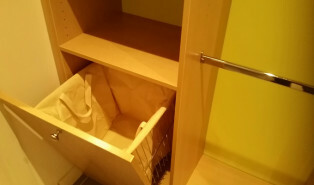 Add a countertop for folding space or a clothes rod for items you wish to dry on a hanger. There are even compact retractable and drop down ironing board options that will make the most of your laundry room and minimize visual clutter.